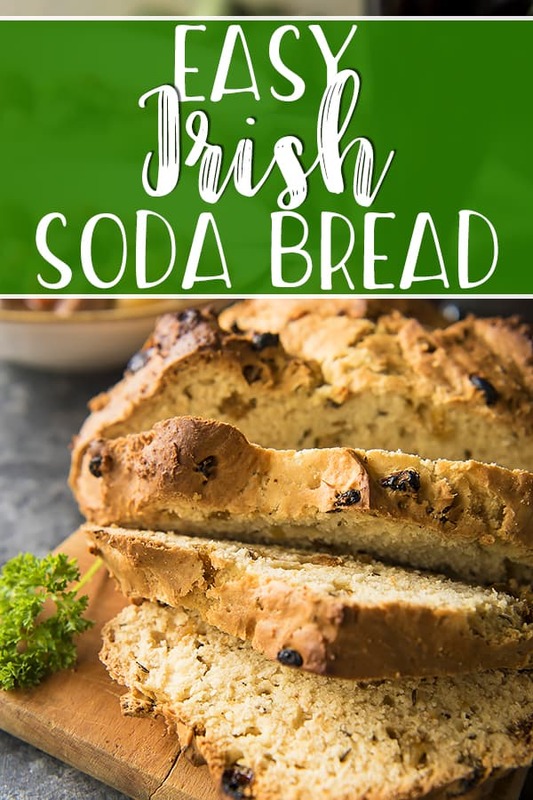 Everyone is Irish for one day in March and a loaf of this easy Irish Soda Bread is a worthy addition to any St. Patrick’s Day meal! This traditional recipe calls for mostly pantry items, with a handful of raisins and caraway seeds tossed in for a sweet and savory texture and flavor. I take back all the bad things I’ve ever felt and said about Irish soda bread. If you’ve ever had both store-bought and homemade soda bread, you might know what I’m talking about. Tiny, dense, gummy, and chock-full of candied fruit and topped with crunchy sugar…sound familiar? Barf. I’ve never been a fan. Not until I tried my hand at making it myself. Night and day, my friends. Completely. 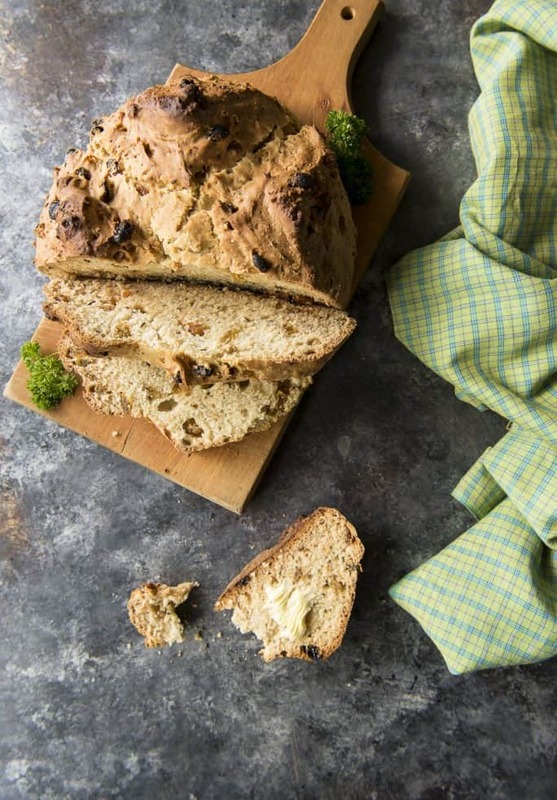 If you make anything Irish this week, make it a loaf of this soda bread. It doesn’t even need a main course to be enjoyed to the fullest. A little butter (or a lot of Kerrygold, if you’re anything like me) and you’re good to go! It’s also a tasty vessel for some homemade apple butter if you’re looking for something a little sweeter. I’m still a little run-down from our trip to Cali, so I’m gonna keep today’s post short, sweet, and as educational as possible. 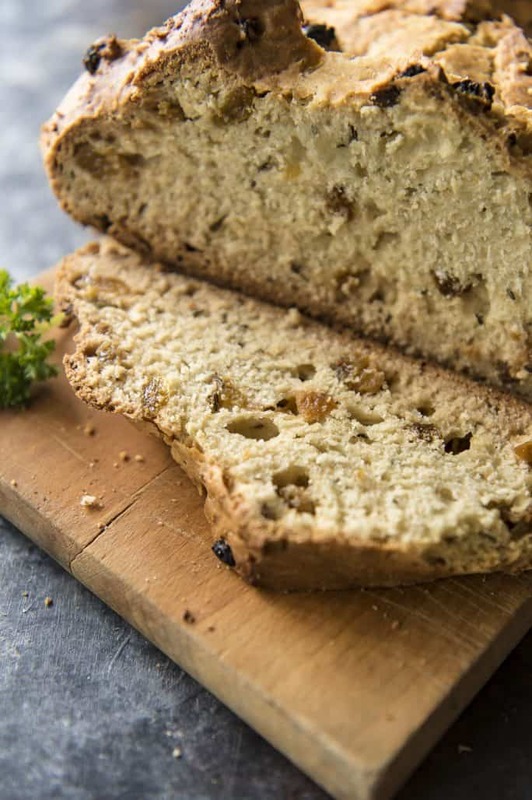 Trust me – this education showed me how to appreciate soda bread. Hopefully, it will do the same for you! 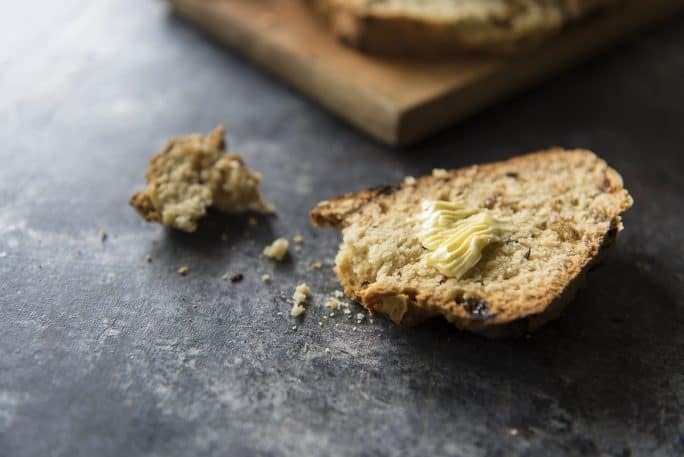 What is Irish soda bread supposed to taste like? 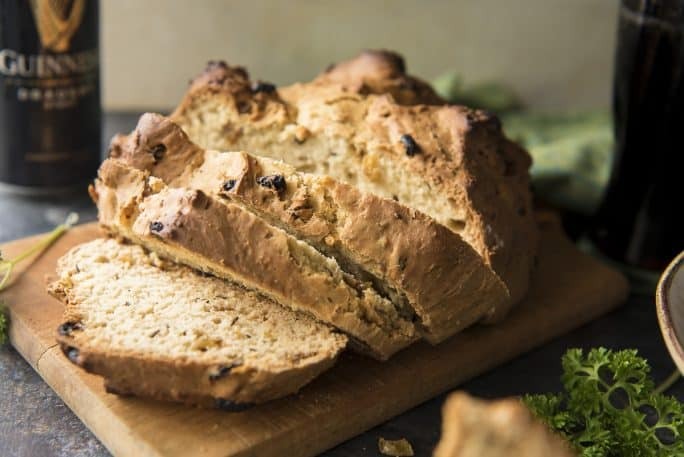 Traditional Irish soda bread recipes call for only 4 ingredients: flour, baking soda, salt, and some room temperature buttermilk. This will yield you a chewy, tender loaf of quick bread. To some, this true Irish soda bread method also means dry, plain, cardboard-like. The recipe in this post has been adapted from multiple test batches. I’ve added some butter (to give it a little extra body), a tiny bit of sugar, and raisins and caraway seeds that are completely optional. If you’re not a fan of either, a handful of black currants are another traditional mix-in you might prefer. What can I use instead of buttermilk for soda bread? This recipe calls for 1 1/2 cups of buttermilk. If you’re fresh out, you can make a homemade version in a pinch! Simply measure out a scant 1 1/2 cups of whole milk and stir in 2 tablespoons of lemon juice or white vinegar. Let it sit for 10 minutes and boom – buttermilk substitute. This buttermilk substitute works in just about any baked good, as well! I use it all the time for cakes and other quick bread. Most of the time when I buy buttermilk, either half of it goes bad, or I freeze the rest into cubes and forget about them in the back of my freezer. Very easily! You can be enjoying this tasty treat in about an hour if you’re a quick mix artist. 1. Preheat oven to 425 degrees F. Lightly flour a 12-inch cast iron pan or a baking sheet; set aside. 2. In a large bowl, mix together the flour, sugar, baking soda, and salt. Massage in the cold butter with your fingers until a coarse meal is formed. 3. Stir in the raisins and caraway seeds, if using. 5. 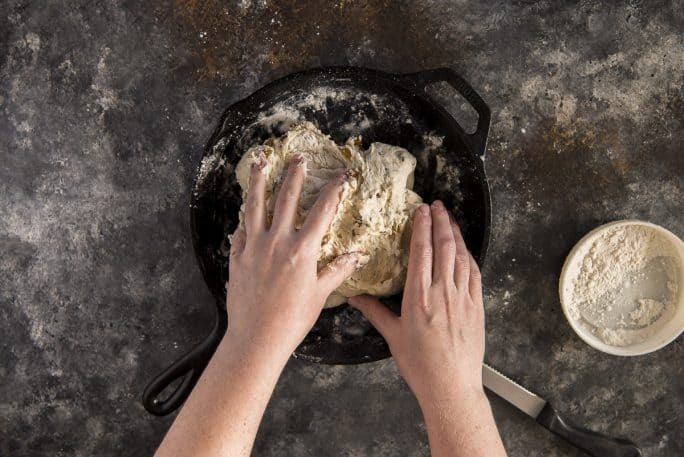 Turn dough onto a lightly floured surface, kneading briefly before forming it into a round loaf. Place it in the prepared cast iron skillet. 6. Flatten the dough slightly, then use a sharp knife to cut a cross on the top. Bake for about 35-45 minutes (the cast iron will take a bit longer), until the loaf sounds hollow when tapped. Cool on a wire rack, then serve warm with butter. 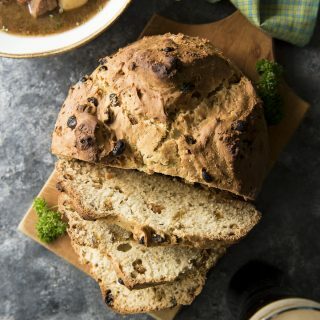 Need something to chow down on with this Irish soda bread? Try one of these tasty dinner recipes! Also – stop by the blog on Friday for an ALL NEW delicious stew recipe that this will be perfect with! 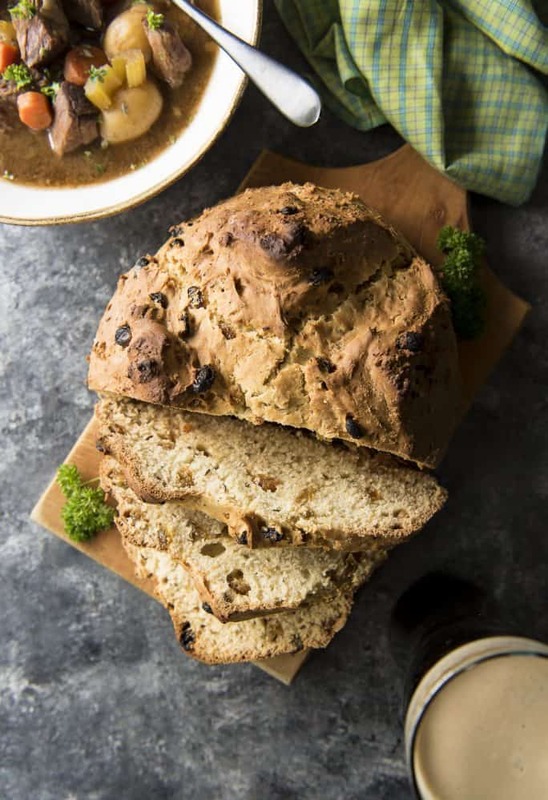 Everyone is Irish for one day in March and a loaf of this easy Irish Soda Bread is a worthy addition to any St. Patrick's Day meal! This traditional recipe calls for mostly pantry items, with a handful of raisins and caraway seeds tossed in for a sweet and savory texture and flavor. Preheat oven to 425 degrees F. Lightly flour a 12-inch cast iron pan or a baking sheet; set aside. In a large bowl, mix together the flour, sugar, baking soda, and salt. Massage in the cold butter with your fingers until a coarse meal is formed. Stir in the raisins and caraway seeds, if using. 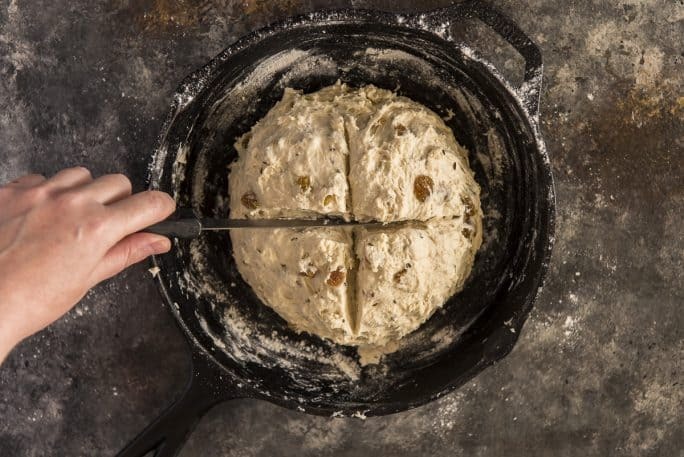 Turn dough onto a lightly floured surface, kneading briefly before forming it into a round loaf. Place it in the prepared cast iron skillet. Flatten the dough slightly, then use a sharp knife to cut a cross on the top. Bake for about 35-45 minutes (the cast iron will take a bit longer), until the loaf sounds hollow when tapped. Cool on a wire rack, then serve warm with butter. 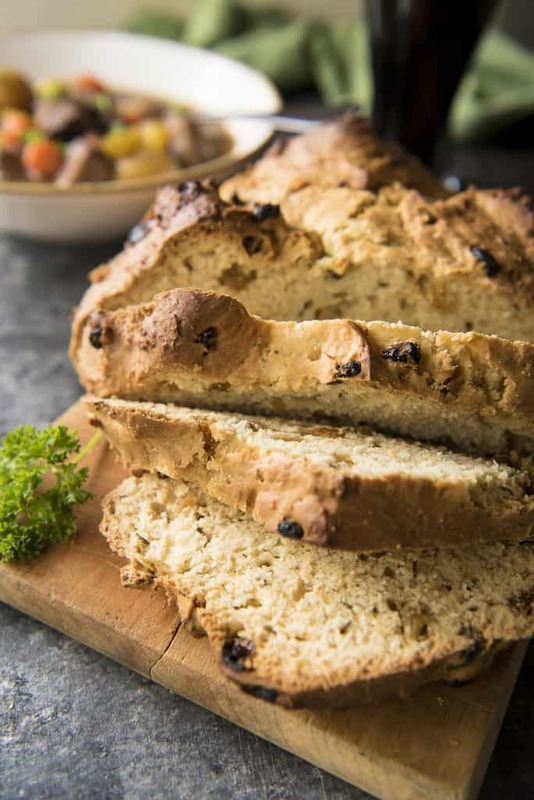 PIN THIS EASY IRISH SODA BREAD RECIPE FOR LATER! I love your tip for making buttermilk in a pinch! The photos were making my mouth water also I just popped a loaf into the oven. It smells heavenly!